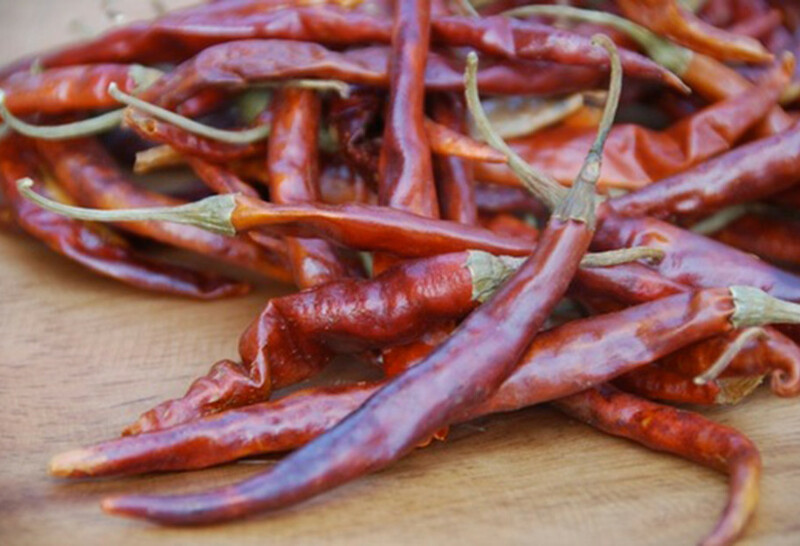 Chile de árbol is a very spicy, yet incredibly flavorful dried chile. It is small, but elongated and thin. It has a deep and shinny orange-red color and it is used in many, many ways. It is often crushed for very spicy table salsas, though it is also used to add flavor and a bit of heat if not opened when cooking, amongst others. It goes by other names like bravo because of its heat (aggressive), and pico de paloma (doves peak) or cola de rata (rat’s tale) because of its thin and pointy physique. It is also called Sanjuanero, I have still yet to find out why. It is eaten throughout Mexico and can be found almost anywhere in the US. Using some of those tonight in the pozole I’m cooking! How do chiles de árbol compare with chiles japoneses? Oh they look very similar, but the chiles de arbol has a bit more heat. We love rehydrating chiles de árbol in our tomatillo salsa. I didn’t know about them at all until after I watched some of your shows a couple years ago. Thanks you! Yum! And thank you for tuning in, Justin. Hola Pati, quisiera saber por que la salsa de chile de arbol me sale últimamente sin picar. Que le podría agregar para que salga con buen sabor? Pati, I would like to make your Roasted Broccoli & Cauliflower with Queso Cotija Dressing. It sounds so good! Excuse my ignorance, but the chiles de arbol are purchased as dried chiles? And in this recipe are they simply chopped dry, without doing anything to reconstitute the chiles in liquid? And finally, if my family prefers a heat level somewhere between mild and medium, would you recommend using one less chile, or would that compromise the flavor? Can’t wait to try this! Thanks for your help! The chiles de arbol in this recipe don’t need to be rehydrated. You use them like you would red pepper flakes…small chopped up flakes for an added kick. You can absolutely adjust the amount you use to your family’s taste. I hope they enjoy it! Lil’ place by my work serves tiny containers of this bright red, very watery salsa with their food. I finally asked what was in it and they said it was just chile de arbol. I don’t even think they roast the chiles since its still bright red and not a dark brown like some I’ve roasted at home. I would LOVE to figure out the recipe. Nothing else dark red or green in the salsa. I’m hoping you might know of recipe Ü Love your website! So many of our favorite Mexican recipe come from you! Thanks so much! Here in Kansas the Mexican Restaurants serve a version called Salsa Picosa. It is a orange color also with very little seeds in it. They tell me it is made from Chili de Arbol’s and Tomitalla’s. I have yet to duplicate it. Every time I try to duplicate it turns out more green than orange with lots of the seeds from the Tomitalla’s and peppers, when I increase the peppers it just seems to make it hotter and still greenish. I would love a recipe of a base chili sauce using this chili. Hola Alice, I will be sure to post one soon. I know of a delicious one made with peanuts!